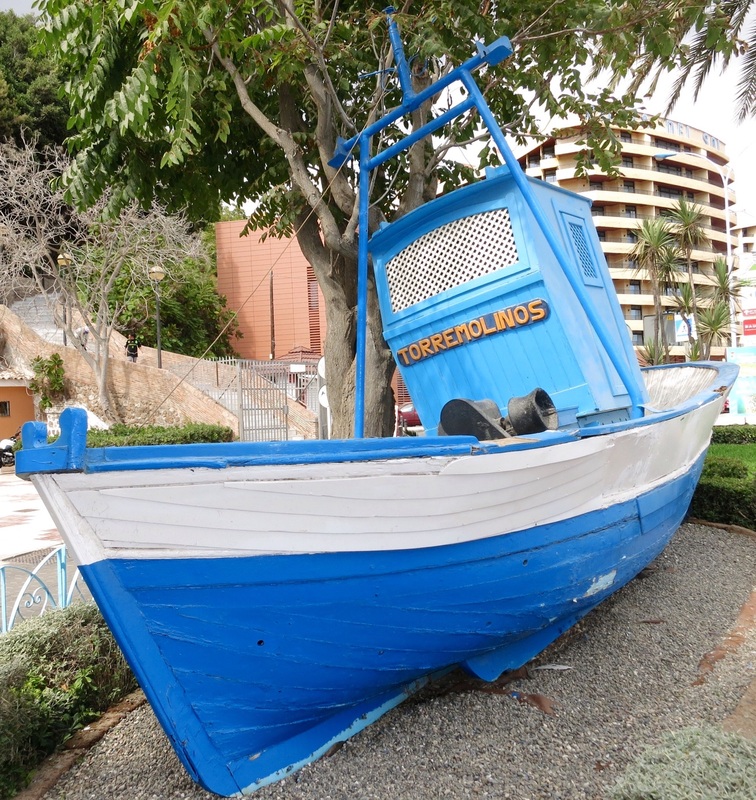 Torremolinos was once a sleepy fishing village but now a thriving tourist town. 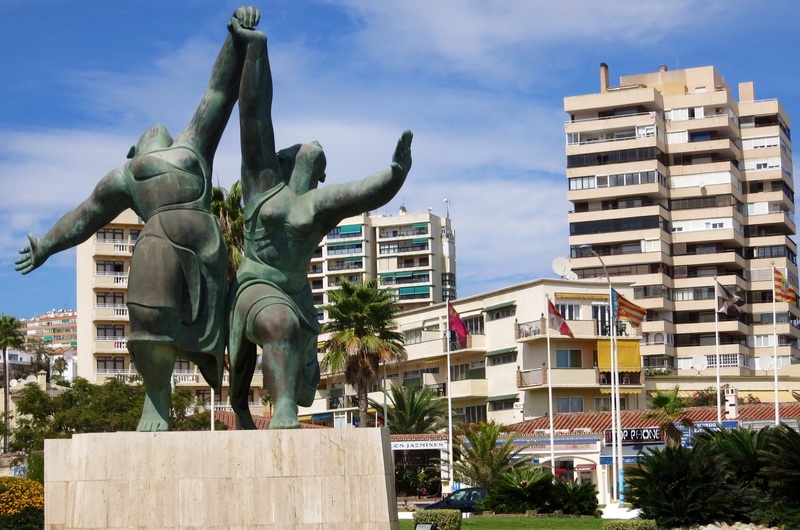 Torremolinos, like most Spanish towns, has it fair share of festivals. And one of the more interesting ones is Day of the Sardine and it happens on 11th June each year. This day brings the locals to the promenade in their thousands, especially the youth of the Malaga region. The day is about eating, drinking and celebrating. 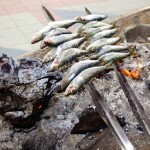 Local restaurants give roasted sardines free to passers by. All this happens at the beginning of summer so everyone is happy and the beach is packed long into the night. We found the odd couple in bar Contacto in La Nogalera bar area of Torremolinos. Super hunk Alex, the very lively and efficient bartender, would be more suited to being on the cover of Mens Health magazine . His guests constantly capture memorable moments, with Alex agreeing to be photographed almost every five minutes. He is not only stunningly handsome on the outside but inside we saw a charming, no attitude, polite and warm ombré. 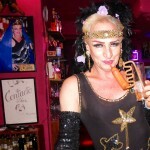 Robert the owner of the bar also ensures the fun continues inside, with disco lights and mirror balls spinning, 80’s music playing and his own dress up show behind the bar. 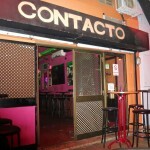 Contacto is the oldest gay bar in Torremolinos but competes very well with its younger rivals. For a relaxed fun good time we can recommend at least one drink at bar Contacto, even if it’s just to see Alex and to meet Robert and say Hello from us. Robert likes to entertain his guests with a little show some evenings. CONTACTO is a friendly bar in La Nogalera. We bought a one day bus excursion to Granada where the Alhambra is located. This we found was the best way to see the Alhambra. 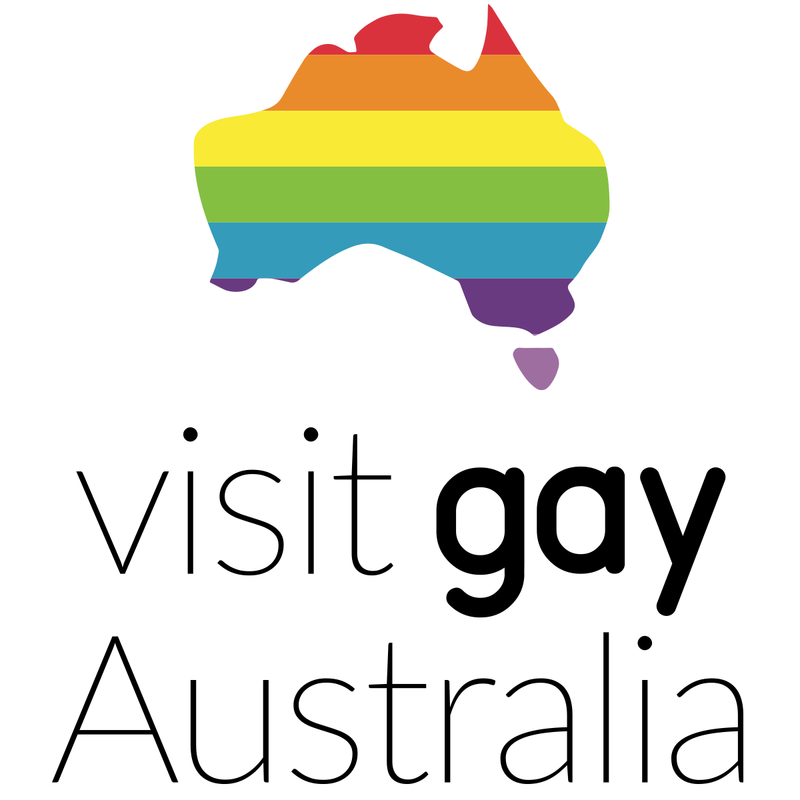 In the height of summer it has 8000 visitors a day and you need to book way ahead, even up to a month. We had to wait 8 days before we could go but it was worth the wait. The Alhambra was originally a small fortress built in 889AD. The Moores moved in around the mid 11th century and they renovated and built the palace walls you see today. In 1333 it was converted into a Royal palace for Yusfus 1 the Sultan of Granada. The Alhambra had further additions in the 1500’s when it became a palace for Christian Spanish monarchs. It is now Spain’s most important tourist attraction. The Alhambra is truly spectacular with its amazing courtyards, columns, colourful ceramic tiling, detailed wall carvings, and ornate ceilings. The gardens, originally a retreat for the King, are well worth seeing. Don’t forget to spend a few hours in Granada itself. It has lovely old streets and plazas and we enjoyed lunch in one of them, sitting outside sipping Spanish wine, enjoying cheese, Jamon Iberico (ham) and we also shared a cheese Spanish omelet. You need to do something nice for yourself occasionally! The Tourist Information Office is right on Bajondillo beachfront and has very helpful hints. 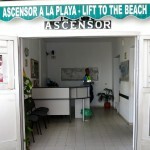 Take the ascensor to the beach from the top of the town centre. 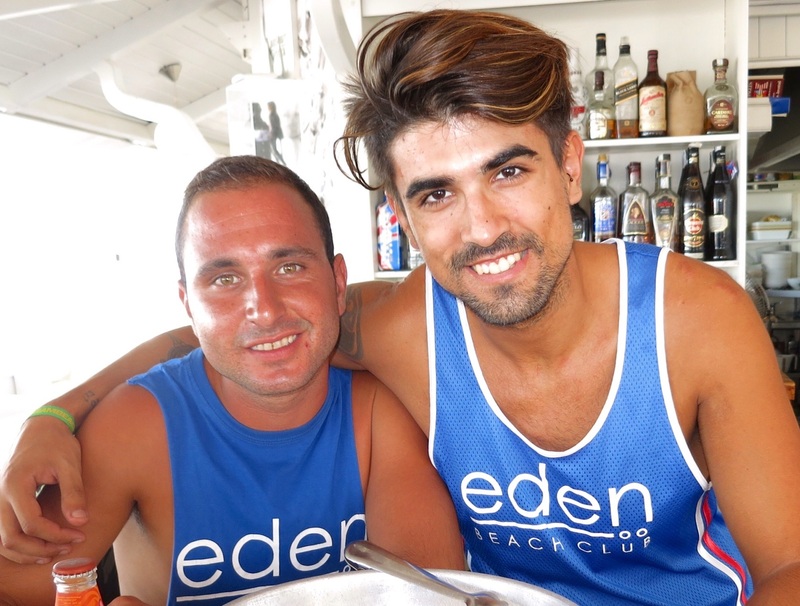 The boys at Eden Beach Club will organise food and drinks so you can relax all day. 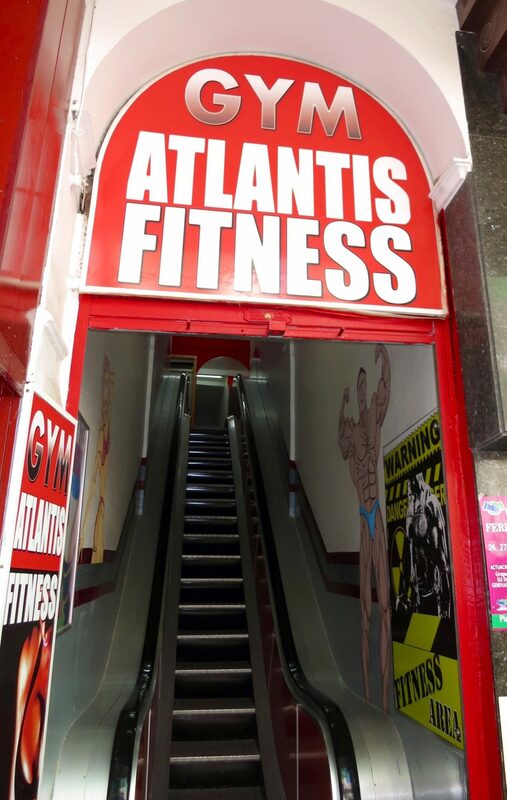 There are a few gyms in town so no excuse for missing the exercise regime while on vacation. 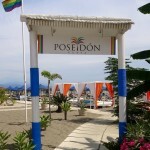 Poseidon Beach Club, another gay area, is on Bajondillo Beach. 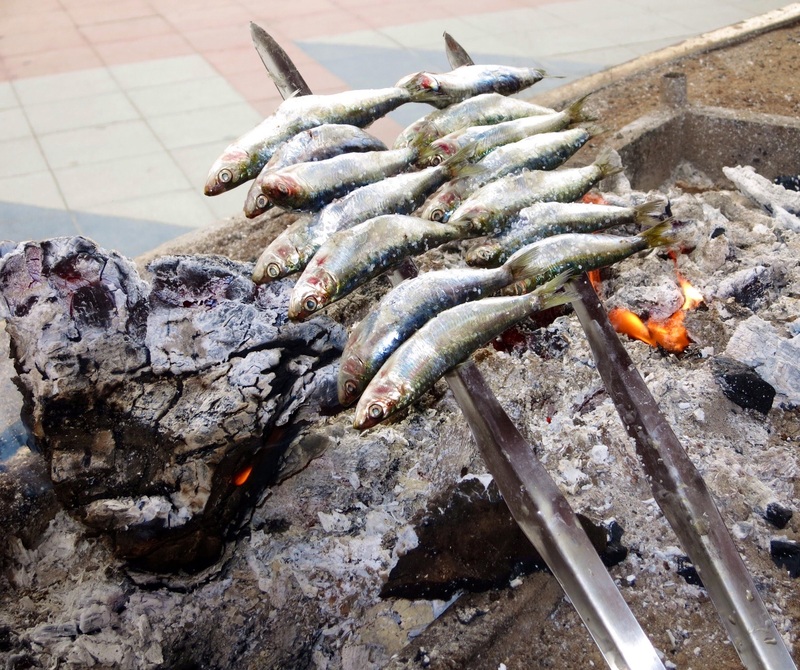 Sardines are a local specialty and even a reason for a yearly fiesta. 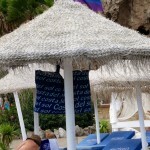 Eden Beach Club is a preferred area for relaxing. We had a very positive experience flying Vueling, the budget Spanish airline, from Barcelona to Malaga. 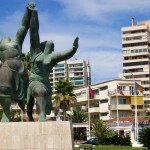 Torremolinos is a 20€ taxi ride from Malaga airport to the centre of town. 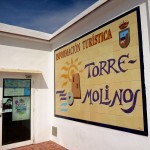 Early September is a great time to visit Torremolinos but the water is cool to cold. Arrive earlier and the weather and water will be hotter but the beaches will be much more crowded. 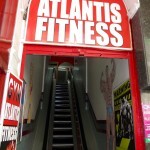 There are several ways from the main town of Torremolinos to the beach. Walk down the winding steps starting at Calle San Miguel right in the heart of town, or take the road left of the Cervantes hotel. 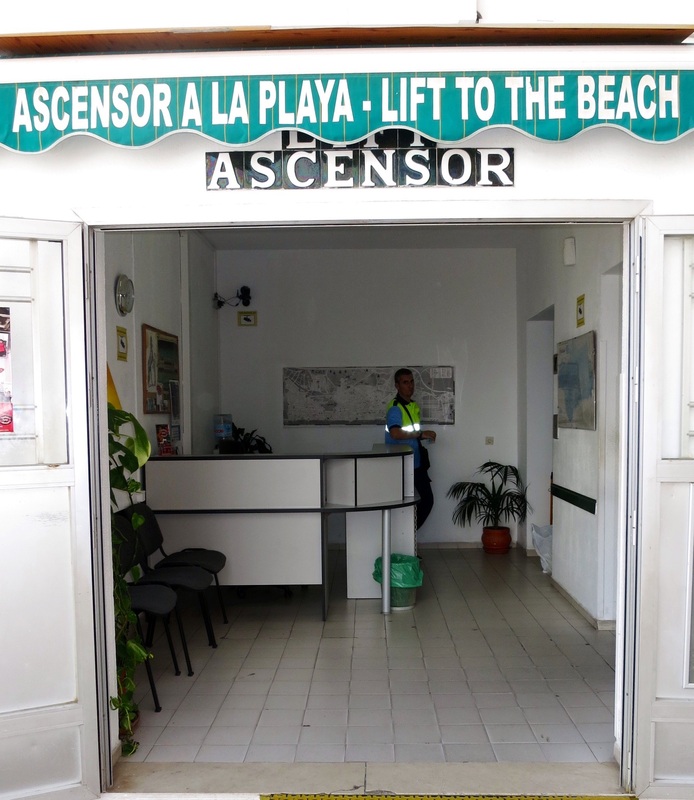 You can make it easy on yourself by taking the ascensor or lift for 30 cents one way. 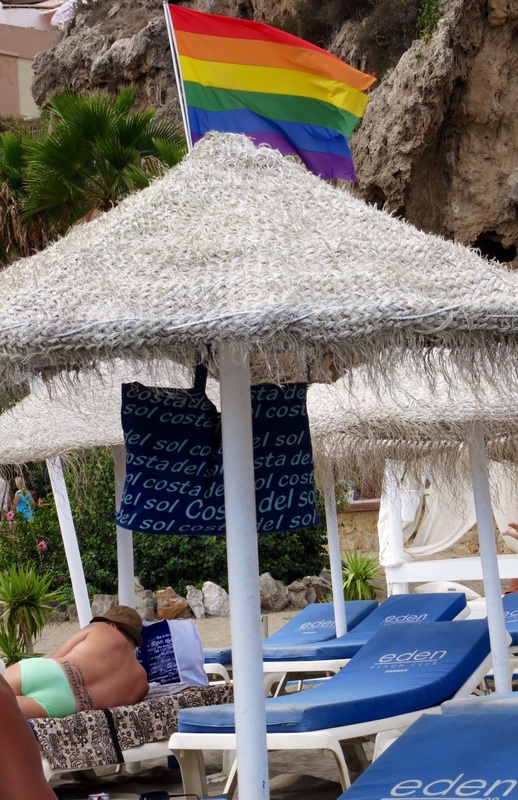 Eden Beach Club and El Gato Beach are the main gay beaches in Torremolinos found at the southern end of the promenade in Torremolinos. 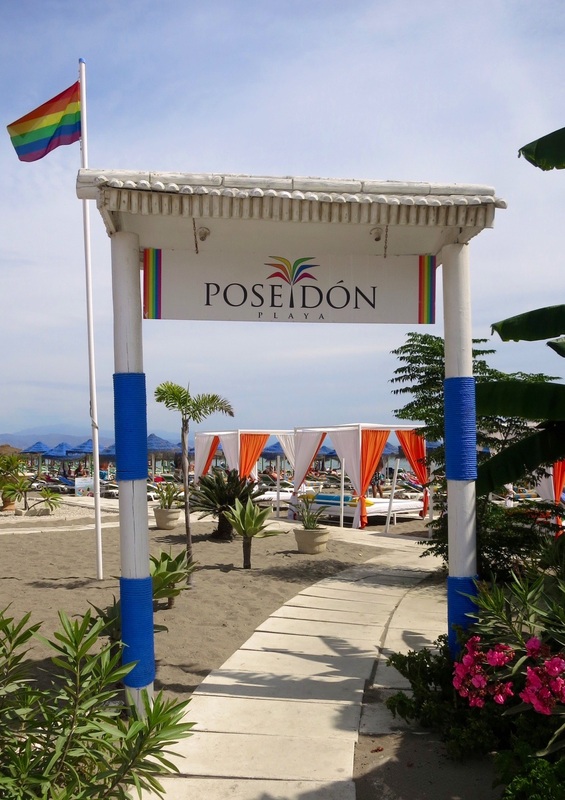 You will also find Poseidon Beach Club has a dedicated following of gay groupies, up towards the northern end of the beach, called Bajondillo Beach. 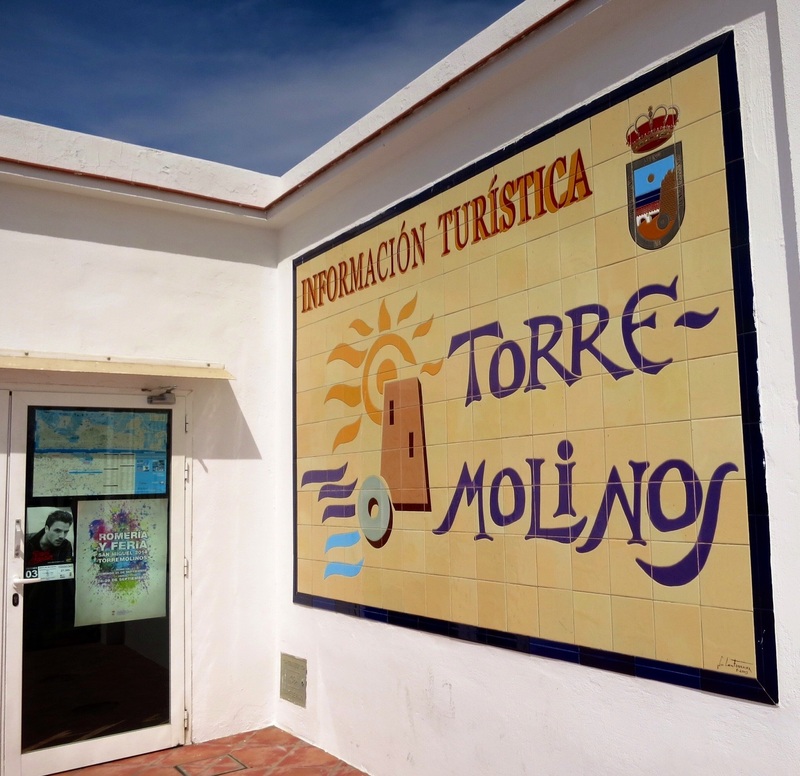 You will find the Tourist Information Office near the statue of the Two Dancing Ladies on Bajondillo Beachfront. 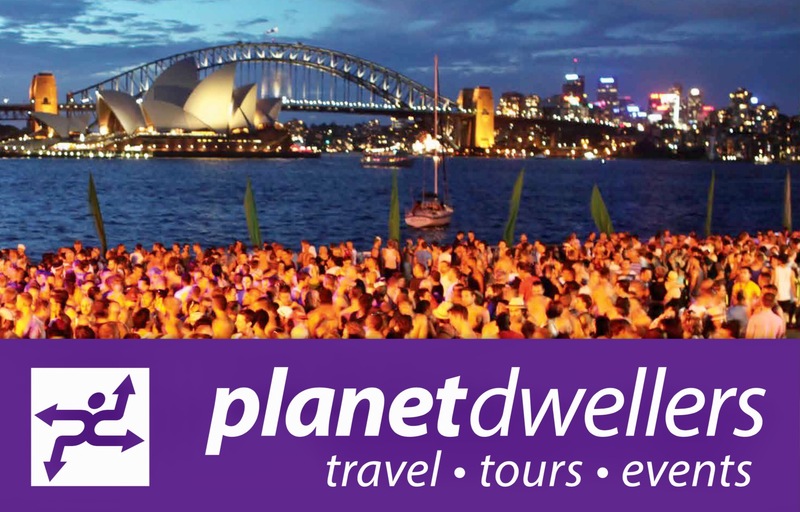 The information provided was extremely lhelpful about day and overnight excursions, catching local transport etc. 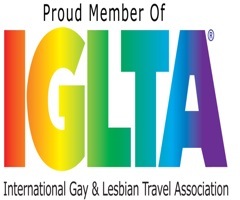 The late night bars, clubs and a sauna (Utopia) are found in La Nogalera, the gay area more or less in the centre of town. All the bars open around 11:00pm and party time is until at least five in the morning. Sun lounges and umbrellas on the beach are 4€ per person.El Gato lounge and bar on the beach has excellent food, coffee and is a party central most nights in sumner. It is Ok to drink the water from the tap. 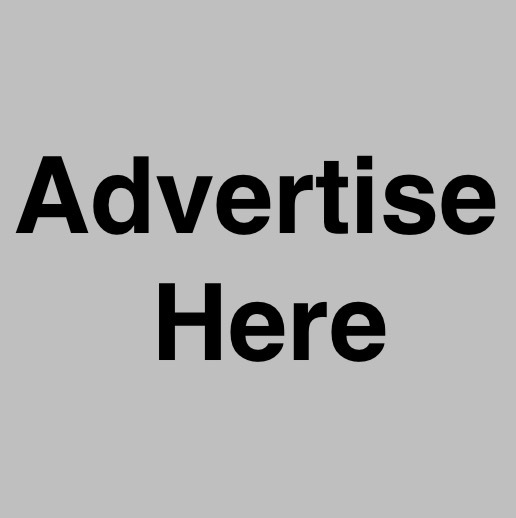 You will see lots of locals using water fountains around the beach.Sick of Spanish food, try these places for Chinese – Shanghai, Indian – Katmandu, Italian – La Piazzetta or even Indonesian simply called Restaurant Indonesian. Take a long walk around the southern headland to the fishing village at Fuengirola.  There are easy day trips to Granada, Ronda, Cadiz and the famous rock of Gibraltar from Torremolinos. Do a side trip to Seville for three days at 32€ per person return on the train (leaving from the main rail station in Malaga). While in Seville stay at Pierre et Vacances, just a short walk from the centre of the city.